Cutting and Pasting with Angela Tannehill. Lover Moon by Angela Tannehill. 2016 12” x 24” mixed media on cradled panel board. Courtesy of the Artist. Angela Tannehill has been creating since she was a child living in the country. “I’d make things out of whatever was on hand—milkweed pods became mice, seashells turned into frog faces, the paper lining from my mom’s pantyhose became a sketch pad,” she remembers. Heady by Angela Tannehill. 2016 12” x 24” mixed media on cradled panel board. Courtesy of the artist. Despite Tannehill’s early creativity and degree in painting and printmaking, she took a break from creating after college. 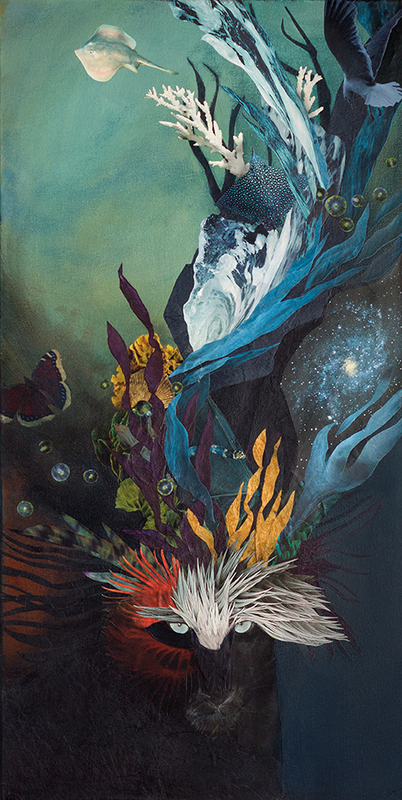 It was not until six years ago that she slowly came back to her roots, starting with small found-object robots, then sewing cloth creatures, and finally her current medium of collage. Now Tannehill is both a mixed media artist and self-employed and self-proclaimed “designer for do-gooders” who provides services for local non-profit organizations in and around the Sacramento area. When not exploring the “connections between seemingly disparate entities” in her work, Tannehill works with clients like 916 Ink, an organization devoted to “empowering at-risk youth with the gift of self-expression through writing,” says the artist. She has designed their books, serves as a board member, and donates her time to their cause. 15 x 30, mixed media on canvas. Courtesy of the artist. Until then you can catch Tannehill’s work in the show Masked, curated by Lorrie Kempf from September 16ht to November 16th at the SMUD Gallery 6301 S Street (at 65th Street), Sacramento. Her microart will be up DaDas Art Gallery Boutique in October. The Boutique is at 3655 J St, Sacramento. You can also pick up a tote with She Was Everything (above) on it at The Starving Canvas. Tannehill is also curating a show around the theme of Tarot cards for next year, with the possibility of a complimentary zine or book. If you are interested in joining the show or finding out more, click here or follow her on Facebook. Tags: 916 Ink, Angela Tannehill, Art, Artist, collage, Da Das Art Gallery, Epson printer and scanner, Katta Hules, Lauren Gilmore, Lorrie Kempf, Masks, MicroArt, nature, SMUC, Studio 10, Tarot, The Starving Canvas, TUBE. Magazine. Bookmark the permalink.